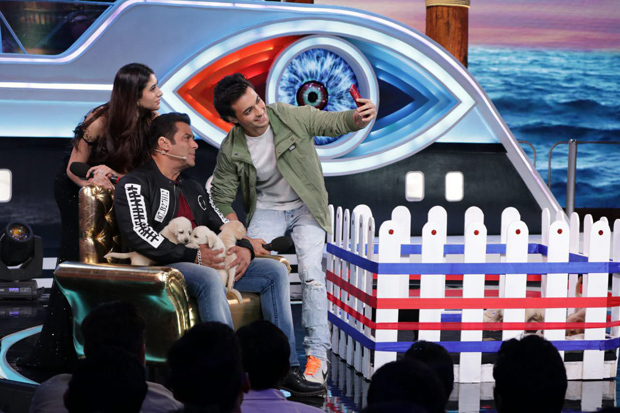 Salman Khan‘s Weekend Ka Vaar episode on Sunday, September 30 was full of surprises and even a few shocks to the contestants. Bigg Boss threw the biggest twist over the weekend of double evictions because nobody went out after the first week. Inmates were visited by celebrities and Salman played fun games with them which triggered a few inmates, of course. So if you missed out on the Weekend Ka Vaar episode, here’s a lowdown on the highlights of the episode. Salman started the show with a bang after praising Deepak Kumar for his entertainment and singing abilities. He was althoughmore happy upon hearing his newly composed song for Bigg Boss! He then asked the contestants to play the bitter sweet challenge with him wherein he would mouth a statement made by a fellow inmate about a contestant and that person as to guess who. First up was Srishty Rode who was asked to guess and she smashed cake on Dipika’s face which turned out to be wrong. Some contestant called Sreesanth a waste according to Salman but the ex cricketer was unable to guess as he thought it’s Romil which turned out to be false. Karan Patel re-entered the house for a task and Sreesanth was least happy with it. He made the inmates play the donation camp task where every person had to donate a quality to their fellow competitor. Predictably, Sreesanth left the task half way because Nehha donated ‘mental strength’ to him. He got offended yet again and claimed that it takes a man to cry. None of the inmates were impressed with Sree’s behaviour. Karan’s observations were that Shivashish should tone it down and Karanvir Bohra should learn diplomacy to survive. Aayush Sharma and Warina Hussain entered the house to promote Loveyatri. Aayush asked Salman some personal questions like how many girlfriends he has had and of course Salman did not answer. The overall segment was interesting because of Salman and Aayush’s chemistry. Back in the house, Sultani Akhada task was underway between Jasleen and Dipika. The winner is Dipika. Post all the fun, Salman announced double eviction which resulted in Nirmal and Romil leaving the house. Another twist was that both were asked to choose who would re enter the house. Ultimately Romil got to make a comeback with a wildcard contestant Surbhi Rana.